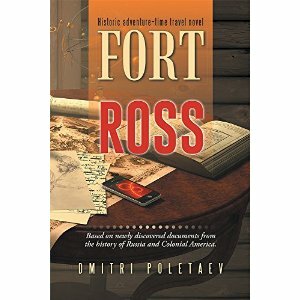 Dmitri Poletaev's "Fort Ross" is a thought-provoking novel about a Russian reporter who time travels back to the southernmost point of the Russian empire in North America during the 1800s. The protagonist, Dmitry, based in New York, discovers that his iPhone allows him to time travel. He travels to the Russian fort called Fort Ross (which still exists). At first, Dmitry just wants to document what he sees -- but he soon realizes he can change the future. His friends, Jeff and Margo, have very different perspectives about what should be done; together, they travel back in time in disguise ... completely unprepared for what awaits them. This is a novel that is imaginative and thought-provoking. The author does an incredible job of weaving together historical fact and fiction to create a story that makes you wonder about the past while entertaining you. Recommended for anyone who likes thought-provoking fiction with historical fact thrown in!